"Open Call" participants and The Shed staff. Photo by Scott Rudd Events. By now, you have surely heard of The Shed. Opening today, the massive new addition to New York’s cultural landscape has almost met a fundraising goal of more than half-a-billion dollars. The multi-disciplinary arts center has pride of place in Hudson Yards, the biggest real estate development in US history by value (so says developer Stephen Ross, whose Related Companies is behind it), on the far west side of Manhattan. Its adjustable structure—which moves to cover or uncover a plaza—was designed by the Diller Scofidio + Renfro studio as lead architect and the Rockwell Group as collaborating architect, and it will keep Instagrammers busy for years. The Shed has sizeable ambitions, as evidenced by its opening programming: A concert series conceived and curated by filmmaker Steve McQueen, a concert by legendary musician Björk, plus an immersive live performance with painter Gerhard Richter alongside music by Steve Reich and Arvo Pärt. Later in the year, look for a kung-fu musical directed by Chen Shi-Zheng and an exhibition of works by conceptual artist Agnes Denes. Arts institutions have been fully embracing multi-disciplinary programming for a while now, a trend that continues with the diverse lineup for this year’s edition of the Whitney Biennial, but generally such presentations have required retrofitting performance into institutions originally designed to hold visual arts. Rarely has there been a purpose- built venue for everything at once. “We’re not siloed into one artistic practice,” says The Shed’s director, Alex Poots, who has spent the last couple of years ramping up for the big opening. The exhibition “Open Call,” opening May 30 and continuing through the summer and into the 2020 season, features 52 emerging artists and collectives based in New York City. All participants were commissioned to create new work, and all received a stipend between $7,000 and $15,000. The multidisciplinary artist Kiyan Williams, for instance, will use dirt donated by the city’s parks department to create a site-specific wall work addressing gentrification and diaspora. The Shed convened six different panels of outside experts to find the talent for “Open Call.” According to Tamara McCaw, the chief civic program officer, “We’re always thinking about what it means to be a civic institution, and located on city-owned land”—in other words, The Shed has taken on the responsibility of representing all of New York. Senior curator Emma Enderby points out that the exhibition will be a noteworthy complement to the concurrent Biennial, with its more- established artists like Nicole Eisenman and Brendan Fernandes. “Our approach is completely grassroots,” she adds, noting that they did everything from post on LinkedIn to contact the Asian American Arts Alliance to tap into unheralded talent. Nigerian-born daàPò reo is one of 52 artists included in The Shed’s “Open Call” exhibition. Photo by Oluwaseye Olusa. For at least one of the artists, daàPò reo, the commission was a major validation. “I’ve jumped over so many hurdles,” says reo, who hails from Lagos, Nigeria, and is now based in Bushwick. “It’s important for someone like me. 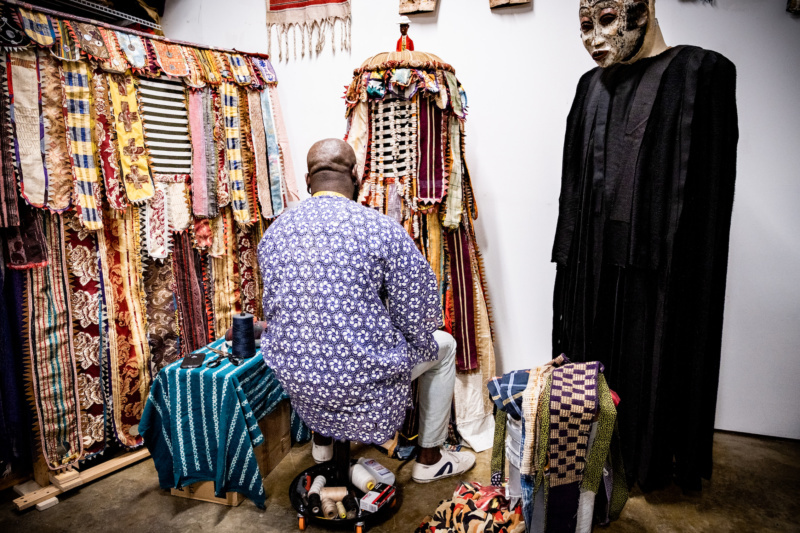 I feel blessed.” In one of his previous works, ALCOHOLOTOPIA (A GEOPOLITICAL DREAM UNDER THE INFLUENCE), reo riffed on the dream of African unity by creating a flag from fabric scraps that looks like a crazy-quilt version of the American flag. 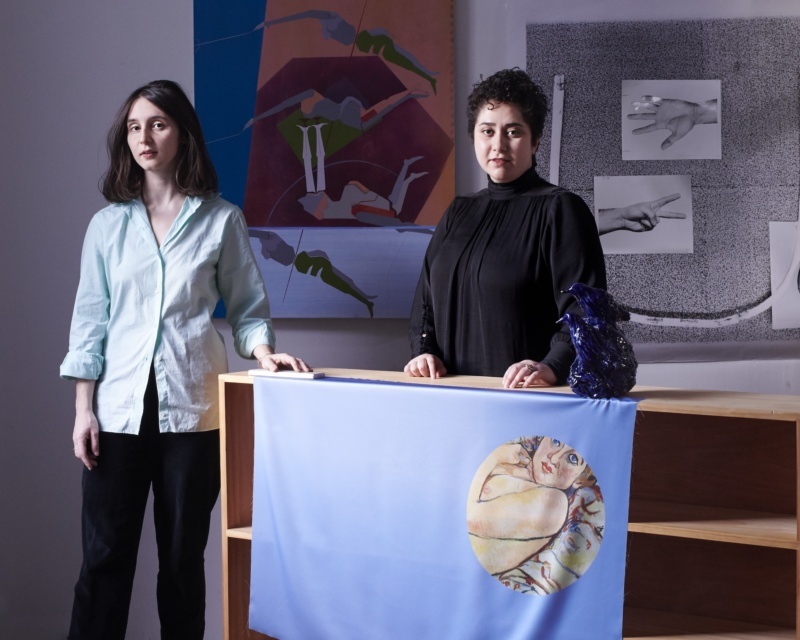 Artists Phoebe d’Heurle and Maryam Hoseini. The inspiration for the presentation is the work of 19th-century artist Suzanne Valadon (1865–1938), who was also a model for Degas and Matisse. You’ve seen her before: She’s the smiling female dancer in Renoir’s famous Dance at Bougival, in the collection of the Museum of Fine Arts, Boston. After her days as an Impressionist muse, she embarked on a 40-year painting career, and was also the mother of the painter Maurice Utrillo. Pictured left: “Open Call” Participants, with Shed Staff. Top Row, L to R: Avram Finkelstein, Troy Michie, Gabriela María Corretjer-Contreras, Richard Sears, Asif Mian, Phoebe d’Heurle, Onyedika Chuke, Emma Enderby (The Shed), Mohammad (Saint Abdullah), Tamara McCaw (The Shed), Julia Weist, Jesse Bandler Firestone (The Shed), Kyle Marshall, Alessandra Gomez (The Shed), Kiyan Williams, Art Domantay (The Shed), Justin Allen, Hugh Hayden, Rachika Samarth, Maya Lee-Parritz, Tahir Carl Karmali. Middle Row, L to R: Mehdi (Saint Abdullah), Tariq Al-Sabir, Christopher Udemezue (Neon Christina), Farzin Lotfi-Jam, Thanushka Yakupitiyage, Caitlin Blanchfield, Maia Chao, Moko Fukuyama, Nia O. Witherspoon, Analisa Teachworth. Seated On Floor, L to R: nicHi douglas, Fana Fraser, Monstah Black (The Illustrious Blacks), Haley Elizabeth Anderson, Harold “Fyütch” Simmons, Farideh Sakhaeifar.